My father insists that the movie theater or rather many of the patrons in the theater were scarier than anything that was happening on the screen. Possibly. I was eleven and not world-weary enough to be wary of the pot-smoking gang of guys sitting in the front seats. That families and their young children were also sitting in the middle rows softens my impression of just how scary the patrons watching “Halloween” in that run down Upper West Side movie theater in the fall of 1978 might have been. But my father insists to this day he was more afraid of the surroundings than the movie. Yet I remember him jumping in his seat in the back row to my left more than once, as was my 16 year old brother David to my right. I meanwhile was cowering, crouched low in my seat, knees up, chewing on my jacket in abject terror. The theater and patrons had nothing to do with that. It was the movie that absolutely terrorized me. It was also one of the great movie theater experiences of my life. A total terror filled treat. It wouldn’t be long till I taught myself the simple if unusually metered “Halloween” theme on the piano, playing the tinkling upper notes and the booming low octaves with relish and the pedal pressed down. I’ve heard theories that what makes a movie the scariest movie one has ever seen has less to do with the quality of the filmmaking or the scares, although it helps, than with one’s age and circumstances when one saw the film. 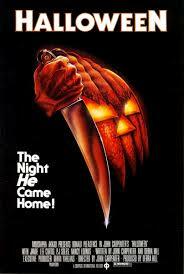 Most people’s scariest movie is one they first saw as a teen or tween. Well, I was eleven, visiting my grandmother in New York City with my dad and brother, and “Halloween” was out in theaters and a big hit with audiences and critics. The ads in the papers touted glowing reviews and the tag lines: “When were you last scared out of your wits by a movie” and “We dare you to see it”. I was a kid who loved to watch the old Universal and Hammer horror movies on German TV. Also, American Forces Network TV in Berlin would show a b movie “creature feature” every Friday night and I would often stay up late to indulge. I pestered my father to take us to see “Halloween” at the neighborhood cinema near my grandmother’s house and he relented. Permissive 1970’s parenting perhaps. “Halloween” would prove a whole other animal than those comparatively quaint oldies and b movies I’d enjoyed on TV. To this day it remains the scariest movie watching experience I have ever had. “Halloween” is often listed as one of the scariest movies ever made, but most of those lists put “The Exorcist” at the top. 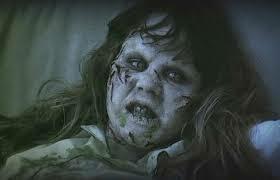 I had also wanted to see “The Exorcist” during a previous visit to New York. But I was eight then and my parents said there is no way we would see it (not that permissive after all). However after I was tucked to bed, my parents left me with my grandmother and saw the movie with my brother David. Or at least that is the story which he loudly, tauntingly reveled in the next day. I was very upset and didn’t want to believe him. I’m still not sure whether he really did see “The Exorcist” that night. I myself did finally see it in my twenties, and though I liked it, I didn’t find it that scary. Extreme fantasy effects and demonic possession don’t rattle me as much as a creeping menace that modulates to a horror that is grounded in reality. 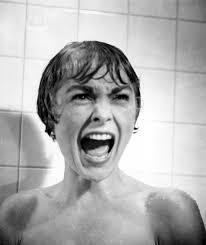 “Psycho” probably would have scared me out of my mind when I first saw it, except I had already learned its secrets and had seen clips of the notorious shower and staircase scenes when I watched a televised tribute to Alfred Hitchcock before finally seeing the whole movie from beginning to end. Only the cellar reveal was a horrific surprise for me. Still I did enjoy playing our video of “Psycho” to a succession of innocent high school friends, watching them be scared half out of their minds. Back to “Halloween”, New York City, 1978, in a dilapidated Upper West Side cinema that, even though it would eventually be renovated, wouldn’t survive the multiplex era. While my father nervously smelled the odor of urine and pot in the air, I was sinking ever lower into my seat and clutching my jacket ever closer towards my clenching teeth as the movie progressed. John Carpenter has talked about how that movie was deliberately made to be an exercise in mounting tension, suspense and fear, with burst of horrific catharsis. No kidding. 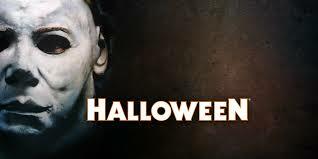 And “Halloween” achieves its scares with a simple plot, engaging performers, and nerve-racking music, but mainly a ruthlessly executed combination of framing, editing, visual teasing and withholding that ratchets up the tension until the terror blister is burst by another very bad event. There is killing, but very little blood, and nothing I would call gory. The BOO! moments are so effective not so much in what they show but by how the audience was played like a fiddle before getting to the discordant chord. 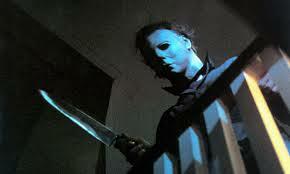 The movie is as deliberate and inevitable and efficient as Michael Myers, its “bogeyman”, is himself. As “Halloween” put us in the theater through our paces, the screams that erupted during the ever escalating shock moments grew louder and more desperate. The gang of guys in the front started to get rowdy. A black girl about my age in a powder blue winter coat ran up the aisle out of the theater, but then would come back in hovering near us by the aisle, then would rush back out into the foyer, then come back in watching with her hands clutching her face. Rushing out, creeping back in, like a petrified pendulum. Fleeing the house, she screams for help, but to no avail. Running back to the Doyle house, she realizes she lost the keys and the door is locked, as she sees Michael approaching in the distance. Laurie panics and screams for Tommy to wake up and open the door quickly. Luckily, Tommy opens the door in time and lets Laurie inside. was the collective roar echoing through the theater. Laurie does get in the house, but (I should probably have inserted a SPOILER ALERT by now) of course so does Michael Meyers. He attacks her. Pandemonium in the theater. She stabs him with a knitting needle and he collapses. She goes upstairs to deal with the children. Michael Myers revives and climbs the stairs. More pandemonium in the theater. Screams and shouts. More scenes of pursuit and hiding and knives slashing through closet slats, and then Laurie stabs Michael in the eye with a wire hanger and finishes him off with his own knife. But the evil evidently can’t die. Because after a minute the body rises, deliberately, undaunted. We see it but Laurie doesn’t, and at that point some of the guys up front were ready to tear out their seats and fling them at the screen to get her attention. The detective Sam Loomis (named after the boyfriend character in “Psycho”) shoots Michael Myers repeatedly with his gun, and Myers falls over the balcony two stories to the ground below, where he lies spread eagle. You’d think he’d be dead now, right? You know, with finality? Sam attends to Laurie, then looks back over the balcony. Of course the body is gone. The famous “Halloween” theme returns. The screen shows night time shots of the houses where the last hours of horror occurred, the creepy sounds of breathing behind the mask that we had been hearing throughout the movie return and get louder; and then the credits roll. And the crowd groaned. 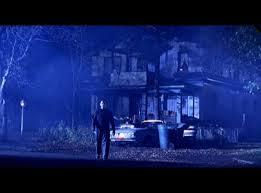 Micheal Myers is still out there. He will always be still out there. I didn’t sleep well that night. My bed was in my grandmother’s living room couch. I kept staring at the elegant 1940’s screen panels my grandmother had set up in the room, imagining the fiend in the dark overcoat and the white dead face mask lurking behind. But I would spend the following months back in school regaling my friends with a shot by shot retelling of the movie. Never again would I think back so fondly on being scared out of my mind in a movie house. This entry was posted in Beginnings, Cinema Scope, Melodies Linger On and tagged 1978, American Forces Network, audience reaction, creature feature, Halloween, Hammer, Hitchcock, horror, Jamie Lee Curtis, John Carpenter, Michael Myers, movie, New York, permissive parenting, Psycho, seedy, The Exorcist, theater, Universal. Bookmark the permalink.